Gold and silver prices declined yesterday for the first time since April 12th. Current gold and silver prices show moderate rises as they seem to bounce back from yesterday’s falls. Despite the falls from yesterday, Gold prices are still above the 1,500$ mark and silver price is still above the 45$ mark. 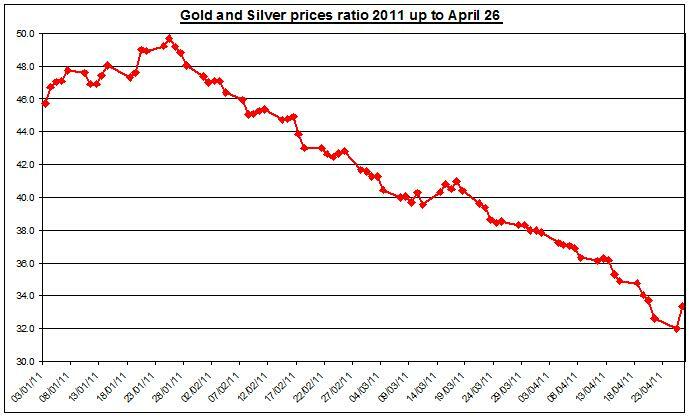 As of yesterday April 26th, silver price has risen by 19.5%, while gold price increased by 5.22%. The gold to silver ratio: As of yesterday, April 26th the ratio between gold and silver prices bounce back and reached 33.35 – This shift in direction is the first one since April 12th. The ratio could be interpreted as one troy ounce (31.1 gram) of gold is worth 33.35 troy ounces of silver. 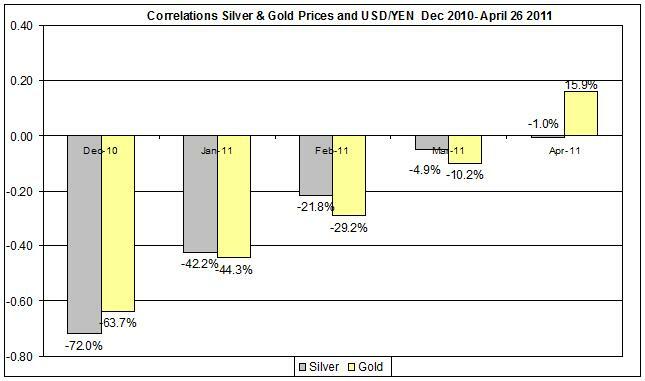 There is also a decline in correlation of the daily percent changes of gold and silver prices as it is at +0.69. I have referred in the couple of weeks ago about the relation of daily percent changes in gold and silver prices and USD/YEN exchange rate. Following that report, I revisit the current correlation of these data series during April. The current correlation of USD/YEN and gold prices (daily percent changes) is at 0.159 – a moderate strength positive correlation. In the previous months the correlation was negative, i.e. as the Yen gets stronger against the USD, gold prices also increased. Due to the tsunami attack that struck Japan back in mid March, it could be that the low correlation of gold and Yen have something to do with the decline in Japan’s role in the gold and silver market. In recent years, Japan shifted from a major consumer of gold to a supplier. According to the Guardian, Libyan officials are at Caracas, Venezuela to find ways to resolve the current turmoil in Libya. See here for a more detailed update on Middle East and its effect on commodities’ markets. 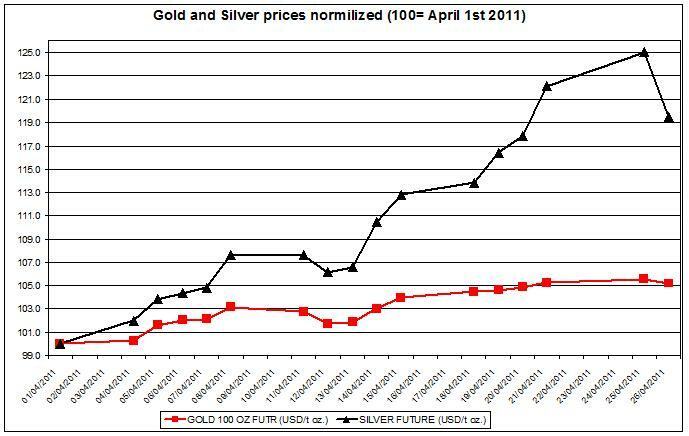 The current gold price, short term futures (May 2011 delivery) is traded at 1,506.8 USD / t oz. a 3.3$ increase or 0.22%, as of 12.27*. Current silver price, short term futures is at 45.320 USD / t oz – a 0.241 incline or 0.53%, as of 12.29*. The current ratio of gold to silver prices is at 33.24. The falls of gold and silver prices seem to be just a short term correction for the market. And weren’t necessarily a shift in direction of these precious metals. From Macro economic perspective there was no recent news that could have affected the actual silver and gold market. The recent bullish market will likely to make a comeback soon. I speculate we will probably continue to see moderate rises in gold and silver prices in the next day or two.